Yellow and brown wires intercept the ignition retard line between the engine and gearbox ECUs. This uses a 12V PWM signal to retard the ignition timing to reduce torque during gearchanges. So what the hell is it doing and why? 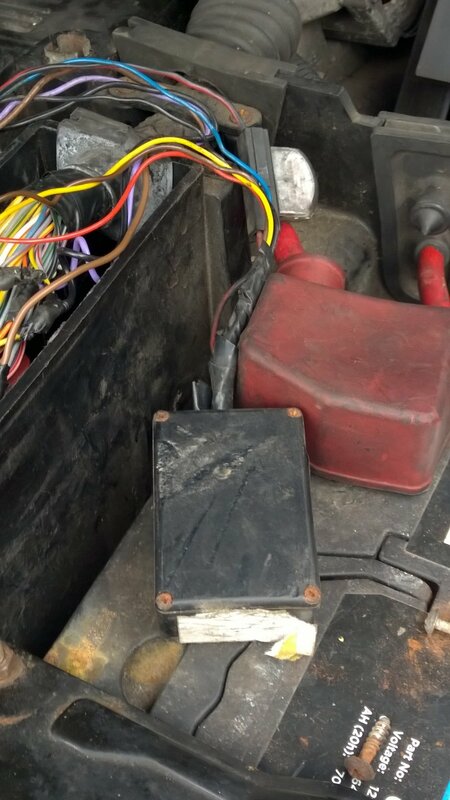 The car drives no differently on petrol or gas and gearchanges are fine on both fuels, no different to my car with a similar LPG system but without this mystery box. Later version has a different case, so wouldn't swear, not seen any early one for years, but it looks not unlike an early 'AEB Joker' advance box, but you reckon this retards the ignition? The line it intercepts is used to retard the ignition (see below), whether it is possible to advance it over that same line I've no idea. Without doing back to back checks with and without it connected while monitoring the ignition advance, I can't think of any other way of checking it. As I've now moved it to inside the ECU housing and soldered and heat shrinked all the connections, that isn't going to be a simple job. gear changes that result in a smooth change. Thanks, sounds like I can take it off then. I'll have the lid off it first though to see what is in it.